Addressing a media conference here today, he said that he would arrange the marriage of boys and girls found celebrating Valentine’s Day only with the consent of their parents. The boy and girl would be handed over to the Police if the parents oppose the marriage. “Let the parents get their children released from the Police custody. Earlier, he had threatened that the Sene activists, who will be accompanied by purohits, would perform the marriage of the pairs spotted on Valentine’s Day. Reacting to the campaign of women’s organisations of sending pink underwear to Sene activists, Mutalik declared that the Sene would gift pink sarees to such women. 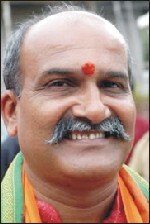 Muthalik will be in Belgaum for Valentine’s Day. Even Happy B’day should not be celebrated if Valentines day is protested. Coz according to indian culture there is nothing as B’day celebration. He should be kicked & then hanged at the chauraha, naked!! WOW GOOD BODY”’ BAAP KA MAAL HAI SHADI KARA DEGA ?